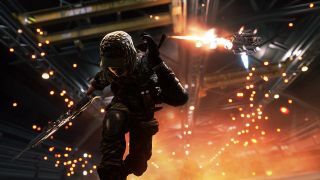 EA's continuing its Road To Battlefield promotion with even more free DLC. Battlefield 4's Final Stand add on is now available for a total of no money across all platforms (including PS3 and Xbox 360) but it's only for a limited time. The promo stops on May 24, so get onto PSN, Xbox Live or Origin before that to snare your freebies. You will obviously need Battlefield 4 to join in. Final Stand moves the action into the blizzards of Russia where you can try a snowmobile for size or test out an experimental hover tanks. There's also bonus futuristic gadgets to test such as a machine gun equipped drone and a new DS-3 Decoy Signal. A bonus Community Mission will also be available until May 24. Score 500,000 with bow kills on any Battlefield 4 multiplayer mode and map and you'll be awarded a shiny gold battlepack. If you don't care about heading back to play and just want the new stuff, here's everything we know about the WW1 set Battlefield 1.